Harding, Stephen. U.S. Army Aircraft Since 1947. Shrewsbury, UK։ Airlife Publishing, 1990. ISBN 1-85310-102-8. Michell, Simon. Jane’s Civil and Military Aircraft Upgrades 1994-95. Coulsdon, UK։ Jane’s Information Group, 1994. ISBN 0-7106-1208-7. Jane’s All The World’s Aircraft 1976-77. London։ Jane’s Yearbooks, 1976, ISBN 0-354-00538-3. ↑ Beechcraft King Air C90GTi. Product Analysis. Hawker Beechcraft Corporation. 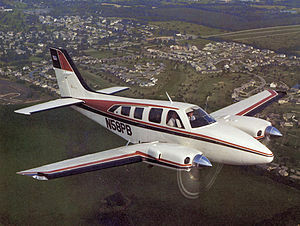 ↑ Beechcraft Baron G58. Product Analysis. Hawker Beechcraft Corporation.